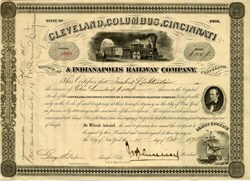 Beautifully engraved Certificate from the Cleveland, Columbus, Cincinnati, and Indianapolis Railway Company issued in 1875. This historic document was printed by the American Banknote Company and has an ornate border around it with vignettes of a train, a ship at sea, and a man's portrait. This item is hand signed by the company�s president, John Henry Devereux and is over 134 years old. John Henry DEVEREUX. railroad manager, born in Boston, Massachusetts, 5 April 1832 ; died in Cleveland, Ohio, 17 March 1886. He was educated in the Portsmouth. N, H., academy, and in 1848 went to Cleveland, Ohio, where he served as construction engineer on several railroads. He removed to Tennessee in 1852, and became prominent in railroad affairs there. At the beginning of the civil war he offered his services to the government, and aided the Union cause as superintendent of military railroads in Virginia. He resigned in 1864, and returned to Cleveland, where he became one of the foremost railroad men in the west. He was chosen president of the Cleveland, Columbus, Cincinnati, and Indianapolis railroad in June 1873, of the Atlantic and Great Western in 1874, and of the Indianapolis and St. Louis in 1880, being receiver of the last-named road from Nay till September 1882. In 1877 General Devereux, by his personal courage, prevented 800 of his men from joining in the railroad riots. He was prominent in the councils of the Protestant Episcopal Church. The Cleveland, Columbus, Cincinnati and Indianapolis Railway was formed from the merger of the Cleveland, Columbus and Cincinnati Railroad with the Bellefontaine Railway in 1868. The Bellefontaine had been formed by a merger of the Bellefontaine and Indiana Railroad and the Indianapolis, Pittsburgh and Cleveland Railroad in 1864. The CCC&I, after its formation in 1868, sought to make a connection to Cincinnati. This connection was never realized by its predecessor line the Cleveland Columbus and Cincinnati Railroad which only ran trains between Cleveland and Columbus. By 1872, the CCC&I made agreements to operate the Cincinnati and Springfield Railroad between Cincinnati and Dayton and the Cincinnati, Sandusky and Cleveland Railroad between Dayton and Springfield, finally providing a through route from Cleveland to Columbus to Cincinnati. In 1889, the CCC&I merged with lines in Indiana and Illinois to form the Cleveland, Cincinnati, Chicago and St. Louis Railroad, known as the Big Four Route. It eventually became a part of the New York Central Railroad.